Ionwood ... continuously releases negative ions and FIR. Supersafe Industries of Malaysia has introduced to the Middle East a new revolutionary product called Ionwood flooring that is claimed to offer a range of health benefits. Manufactured in Malaysia from tropical and imported American wood, Ionwood floorings embody the best wood engineering technology from Germany as well as Japan’s negative ion generation technology, resulting in the world’s first multi-layered engineered solid wood flooring with astounding health benefits, says Hassnat Akram of Knightshot in Dubai, UAE. Knightshot is one of the distributors of Ionwood in the Middle East. 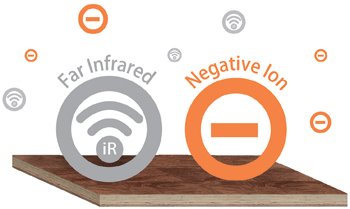 “There is no other wood flooring that releases negative ion and far infrared (FIR),” says Akram. To build the most effective negative ion and FIR wood flooring, the company has developed the most advanced negative ion and FIR activation technology, he says. “We pulverise high-grade natural negative-ion-producing minerals and gemstones, including Germanium and Tourmaline into nanoparticles. This is then infused on the engineered wood flooring. We always ensure that the wood flooring continuously release negative ions and far infrared,” says a spokesperson for Supersafe. Commenting on the benefits of negative ions, he says: “One cannot see, taste or even smell negative ions, but yet in nature they are found in abundance around us. They help our bodies in sustaining and improving our health. Negative ions make us feel good as they destroy harmful bacteria. In nature, negative ions are generated by natural processes such as the ray of the sun, lightning that strikes the air, wave movements in the ocean and from waterfalls. “Negative ions of good quality are found in FIR, invisible radiant energy, which comes from infrared light; it has the ability to penetrate human tissue, which in turn produces a host of anti-aging health benefits. The spokesman points out that modern homes and offices today tend to be low on negative ions but with Ionwood Supersafe flooring, one can combat the ill effects associated with a stressful life. “One will feel better, more relaxed and energised with the presence of negative ions and far infrared,” says the spokesman. 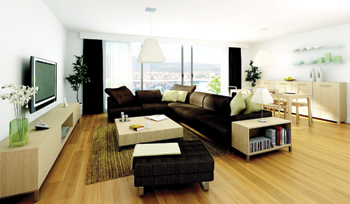 Ionwood flooring, which is certified with PEFC (Programme for the Endorsement of Forest Certification), TUV class (super E0), Jaira (Japan Association of Ion Research), and Kifa (Korea Far Infrared Association), was launched in 2012 by Supersafe Industries in collaboration with Sugawa Ionwood. Supersafe Industries also manufactures rubber tiles, which are certified under ISO 9001:2008 for their quality management system. The tiles are tested and comply with British Standard BS 7188, Head Impact Criteria (HIC) EN1177:2008 and American Society of Testing Materials ASTM F1292-F355 for Critical Fall Height (CFH). “Resilience, dimensional stability and endurance are natural characteristics of Supersafe rubber flooring. Maintenance is minimal and underfoot comfort is excellent, while the product retains its beauty for several years. It is an ideal choice for schools, hospitals, multi-purpose areas including playgrounds, corridors, gymnasiums and auditoriums,” the spokesman concludes.